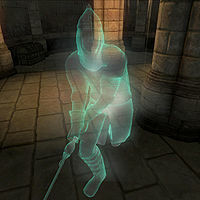 Sir Henrik is a Nord ghost added by the Knights of the Nine official plug-in. He was once a Knight of the Nine, albeit long ago. Sir Henrik wears chainmail boots, gauntlets, greaves, and helmet. He also wears a Knights of the Nine Cuirass and carries a Knights of the Nine Shield. He wields a fine steel claymore in combat. You will meet the ghost of Sir Henrik in the basement of the Priory of the Nine during the quest Priory of the Nine, where he will give you the quest Wisdom of the Ages. Speaking to Sir Henrik for the first time will have him greet you by saying; "If you are true to the teachings of Julianos, it may be possible for you to find the Shield of the Crusader." Telling him that you don't have the time to deal with this issue right now will have him reply; "As you wish." Asking him about the Shield of the Crusader after previously refusing to take up his quest will have him reply; "I can tell you what I know. It is not everything, but it is perhaps enough." If you ask him what he means will have him explain his previous statements: "When the Order crumbled, I set out on my own. After years of searching, I found the Shield and brought it to Fort Bulwark for safe keeping. With the help of a few trusted friends, I began work to keep the Shield safe for all eternity. I never saw my work finished. I died defending the fort from those who would take and misuse the Shield. I never saw our work finished; I trust that the others carried on without me." Asking him about Fort Bulwark will have him give you directions; "It lies in the southeast of Cyrodiil, near the Black Marsh border. If all went according to plan, it should be very well guarded now." Asking him about Fort Bulwark again will have him say; "Look to the southeast of Cyrodiil to find it. I cannot say for certain what is inside, but be prepared for anything." Asking him about the Shield of the Crusader again at this point will have him reply by saying: "The Shield is safeguarded within Fort Bulwark. It is protected, and care must be taken when attempting to find it." Questioning Sir Henrik on Julianos will have him explain the god's domain; "History and knowledge are his domain. He is the God of Wisdom and Logic. He teaches us: "Know the truth. Observe the law. When in doubt, seek wisdom from the wise. ""Asking him about the Knights of the Nine before you destroy the Wraith of Lord Vlindrel will have him ominously say: "Though we went our separate ways when the Order fell, we all served the Nine in our hearts. All but one..." Once The Prophet arrives at the Priory of the Nine, shortly after you destroy the Wraith of Lord Vlindrel, will have him thank you for saving the spirit of Sir Berich and reuniting the old order in death: "We are all reunited once more. You have done what we once thought impossible." After completing the Knights of the Nine quests, his tomb in the basement of the Priory of the Nine grants you Julianos' Blessing; "Julianos blesses you with his wisdom and his guidance. Trust in your knowledge for it is the whole of who you are." The blessing grants you an additional five points to your Intelligence Attribute. This effect is semi-permanent: it stays in effect until you activate another of the Knights' tombs and receive a different blessing.